Abstract: Leonardo da Vinci’s preoccupation with the natural world led him to the fields of optics and astronomy. Though he initially took the theories of his predecessors as truth, da Vinci’s close observation of planetary bodies and the functioning of the human eye led him to reject the predominant, though imperfect, theories of optical and astronomical principles. This rejection allowed da Vinci, the scientist and artist, to question the inherent intricacies of light and optics, and marry the complexities of reflection with the complexities of visual perception. 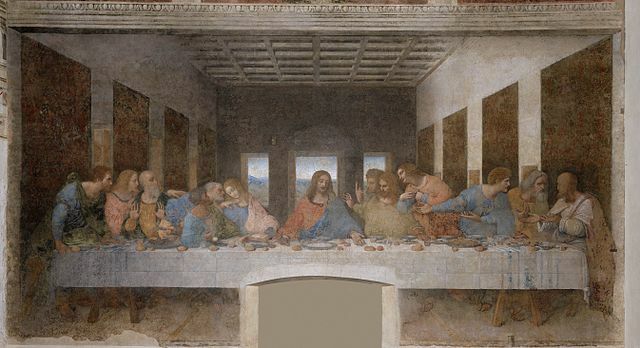 In what is known as his masterpiece in light and perspective, The Last Supper, da Vinci applies his novel, though more complicated understanding of light and optics, translating his scientific inquiry into artistic innovation. Introduction: Leonardo da Vinci’s Milanese observations of optics and astronomy complicated his understanding of light. Though these complications forced him to reject “tidy” interpretations of light and optics, they ultimately allowed him to excel in the portrayal of reflection, shadow, and luminescence. Leonardo da Vinci’s The Last Supper demonstrates this careful study of light and the relation of light to perspective. In the work, da Vinci delved into the complications of optics and reflections, and its renown guided the artistic study of light by subsequent masters. From da Vinci’s personal manuscripts, accounts from his contemporaries, and present-day art historians, the iterative relationship between Leonardo da Vinci’s study of light and study of optics becomes apparent, as well as how his study of the two fields manifested in his paintings.